The North American Handmade Bicycle Show 2014 (HAHBS) takes place in Charlotte NC this weekend. Being I am a cycling aficionado, I could not let the opportunity pass to visit the show. In past years, I’ve seen only pictures of the different hand made bikes in the pages of cycling magazines. So I made the trip today to the Charlotte Convention Center to check the event out. I was NOT disappointed. I had a chance to see some really nice bikes, paint jobs and some very interesting ideas. Rather than show picture and a bunch of text, let me just post a few comments and then you can check out the gallery of some of the most interesting bikes! There were many manufacturers with wood bikes. The frames were all wood and while not exactly my cup of tea, they are nevertheless amazing. I must say I have never ridden a wood bike before, so who knows… If I were to try one out I might like it. Same for bamboo. There were quite a few bamboo and hybrid bamboo bikes. They were all equally amazing. There was a vendor there that had a technique to take a mold in plaster of your feet. He then would use that as a mold to create a hand-made carbon fiber shoe! The shoes were pricey but looked awesome. The manufacturer said he obtained his knowledge from making custom ice skates. These shoes were amazing. There was one manufacturer that made a carbon bike with a honeycomb open air weave of carbon. Most unusual. I have seen pictures of a dude in Europe that made something similar but this was over the top. Several bikes had alternate power supplies – electric motors that is. Tandems. Many tandems. In all kinds of materials. Interesting that many had belt drives instead of chains. Incidentally, my cousin Bob has been using a belt drive on his Seven tandem for many years now with very successful results. Pay close attention towards the end of the gallery – there is a red bike with some really intricate details. The builder is from Japan and the bike had a $20,000 price tag. Certainly very artistic and the details had many, many hours’ worth of work written all over them. Well – what do you think? Comments are welcome! This entry was posted in 6. Cycling, Other and tagged NAHBS 2014 on 15 Mar, 2014 @ 17:21 by bowtie6. Yard Birds, you know… Chickens! Well… With the kind of weather we have had lately, getting a chance to get on my road bike today was a real treat. Just a few days ago we were in single digit temps; yesterday was rain, thunder and lightning (yes in January); today the sun was out, not a cloud in the sky and amazing blue skies. Temps were in the mid 50’s. Go figure. You never know what you are going to find on a bike ride. I suppose the chickens were just like me out to enjoy a sunny beautiful day. I’ve written about this chicken farm before (click here) and today we add the above picture. Nice view indeed. On a completely different note, on one of the roads I ride often, I found a great deal of “patch” road work today. The type of repairs like this were found in the stretch of about 3/4 of a mile on both sides of the yellow line. The reason this struck me was because of the poor quality of the repair. Not very well packed and far from level and smooth. Today, roads riddled with potholes seem the norm. It is sad because the state of South Carolina used to have very good roads. Not anymore. Finally, what just adds icing to the cake is that any initiative to find new funding for road work is immediately turned down by politicians that are more concerned with votes than in doing the right thing. And here is some of the high-tech equipment being used to do the repair work. There were a couple more pieces including a road scraper but I could not get a good picture of them. This entry was posted in 6. Cycling, Other and tagged sightings on 12 Jan, 2014 @ 21:11 by bowtie6. A few weeks ago I posted an article about a vintage early 80’s Bianchi road bike that I restored. I’ve received many emails and comments about it requesting more details about how I went about doing this. So, in answer to all of you who have asked via email, I hope this answers your questions. That day came on a New Year’s day about 3 years ago. I was checking out Craig’s List and sure enough a listing showed up describing a “Bianci (sic) frame for sale – cheap”. The price: $25.00. I contacted the seller and agree to meet at a local pizza shop. After the introductions I offered to buy lunch and shortly after I was the owner of a vintage Bianchi frame. However, it was not exactly in “pristine” shape. The first thing I did was take the frame apart. The headset, seatpost and bottom bracket/cranks were still on the frame. Unfortunately the only thing salvageable was the seatpost. Once all this was stripped I took the frame to a local media blaster. He stripped all the ugly paint that was on the frame from an earlier respray. While the frame was being cleaned up, I purchased a can of Frame Saver. This is stuff is like aerosol cosmolene and used to prevent rust by spraying the inside of the tubes of a steel bike. It is very inexpensive so I thought about giving it a try. Once the frame came back from the media blaster I cleaned it up extensively with automotive paint prep. The frame was then carefully gone over with a tack cloth and sprayed several times with automotive sanding primer. I did this for several reasons: a) I wanted to get a smooth finish and b) I wanted a good “base” for the single-stage acrylic-urethane automotive paint to stick to. I sanded a good bit off with very fine sandpaper – basically the same procedure you would follow to prep a car’s body for paint. It was a challenge because it is hard to get to all the tight corners of the frame. Now before you start questioning the difference in colour between the lid and the can, just remember this was taken with an iPhone and poor lighting. At any rate, this is what the paint looks like. All primers and paint was applied with a small HVLP jamb gun. I used it because it is small enough to handle around all the tubes. I took my time and with the aid of some strategically placed wire hangers I was able to manouver the gun (and myself!) to give a nice even coverage. The trick here is to take your time and work many small coats of paint. All the markings on the frame were done with model-airplane paint. I basically took an obscene amount of time and applied blue paint to all these areas with a model-airplane fine brush. It took patience and a small paper towel doused in automotive paint prep to remove any extra paint outside the “edges”! Installing anything but Campagnolo would have been an insult to this frame. So I did some research and went for a 2008 Veloce groupset. I could have ordered Chorus or Record, but why spend so much? Plus Veloce came in silver which complements the vintage of the frame. I did not want any carbon (more on this later) on this frame, so Veloce was my choice. At the time I bought the groupset, the exchange rate of the GBP to Dollar was very favourable: I ordered the entire group from a vendor in the UK. About a week after I made the buy, the groupset was in a nicely packed box on my doorstep. Cranks are 175mm, with a compact gearing. The rear cassette is Shimano. Yes, I went Shimano for cost reasons. It is a 10 gear 12-27. Why? Because I am old and I need the extra 27 with the compact chainrings – plus this gives me a chance to spin up hills! And, it works! Back in the 80’s the cat’s meow in pedals were Shimano PD-7401. I have a set on my other vintage bike: an 86 Trek 500. One day, while looking on eBay I found a set of brand-new in-the-box PD-7401 pedals. Never used. I promptly snatched them up and installed them on the Campagnolo cranks. The above picture shows the back of the Shimano PD-7401 pedals as well as the stainless steel water bottle cage. Unfortunately, this frame only has one set of bosses for a cage, on the down tube. The pedals were not exactly “cheap”, but then again by this time I figured I might as well build the bike the way I wanted it. These are “Delta” cleat pedals and my Sidi shoes are set up for these pedals. The Veloce shifters turned out to be very disappointing. Turns out that these shifters did not have the progressive “trim” that Chorus/Record have. Instead, they were equipped with the “Escape” mechanism which I dislike very much. So, to fix the problem I ended up buying a brand new set of Chorus shifters on eBay. Now if you are a Campagnolo cognoscenti, you will notice several things wrong here! Veloce did not come with “10 Micron” and “QS Micron” shifters! Those are Chorus with the aluminium Veloce levers. Remember I said I did not want carbon on this bike? The carbon levers are still tucked way in the Chorus box! Hehehe… In case you are wondering, these levers are held in place with a dowel that can easily be punched out. The stem is Bianchi, but from a modern bike. I found a modern adapter so I could use one of the new, modern stems. This is a bit different from the “old school” handlebars and stems. I also added a mount for my Garmin cycling computer. Next, we have the seatpost. This is the only thing that carried over from the “original” bike. It is not name-brand, but it has three really cool scallops on either side. I filled them in with the colours of the Italian flag to pay homage to the bike’s origins. Handlebar tape and saddle are Fizik. I suppose one could argue this is too much celeste, but then again… Why not? The photo above also shows another view of the Italian flag motif as well as the blue painted engraving on the seat post lug. Cool, huh? One last thing I’ve been asked about: where did the decals come from? Well, when I built this bike there was a vendor on eBay that sold the entire sheet of period-correct decals. They are of excellent quality however they are far from cheap. Then again, you get what you pay for. By now I am sure you are scratching your head on how someone might have spent so much time and effort on a 30-year-old bike. Compared to modern bikes this thing is a dinosaur. It is heavy, it is steel, it is old. Then again, it is rather unique. I realize this is not exactly “restored” to original spec, but then again why not use modern components on a vintage frame? This entry was posted in 6. Cycling, Bianchi and tagged Campagnolo, celeste, Vintage Bianchi Road Bike on 03 Nov, 2013 @ 20:48 by bowtie6. The following photos show what the frame looked like when I bought it. The frame was listed on Craigslist of all places, missing many pieces and painted an ugly Grapette purple from a rattle can instead of the classic celeste. Purchase price on the frame was quite cheap – an example of a prior owner not knowing what they had! The frame and fork are Bianchi with lugs stamped with the Bianchi logo. After carefully removing all components, I had a local media blaster remove the old purple paint. This was very carefully done because of the thin tubing. I then shot the frame with a light coat of epoxy primer and started sanding. A few small imperfections required a small dab of automotive body filler and then covered with another thin coat of primer. After another light sanding, the frame was ready for paint. This is where things got interesting! After all, it is not like you can walk up to a store and buy Bianchi celeste paint and paint away. To get the correct color I bought a little bottle of Bianchi celeste touch-up paint. Then, I used an airbrush to paint a small square of primed sheet metal. Once the paint dried I took the sample to a local automotive paint store and had it scanned in a spectrometer. Needless to say, the folks matched the paint perfectly. By the way, this is the non-metallic, basic celeste shade. This is my first attempt to paint a bike frame. It took some doing! I ended up using a small paint gun normally used to paint jambs on a car. Since the tip is fully adjustable painting horizontally and vertically (and everywhere in between) is no problem. Finally, the paint I used is single-stage acrylic and this required no clear coat. The trick is to apply several light coats, building up to a high gloss. Since the frame is Italian the groupset had to be Italian also: a 2008 Campagnolo Veloce with Campagnolo Chorus shifters. I did not like the feel of the Veloce shifters, so I bought a set of carbon Chorus shifters and changed the levers to match the silver look of the rest of the components. Why? Because I can! Wheels are Mavic and the celeste tires are Vittoria. Saddle is a special celeste Fizik. The pictures above show some extra work I did on the little details on the frame. 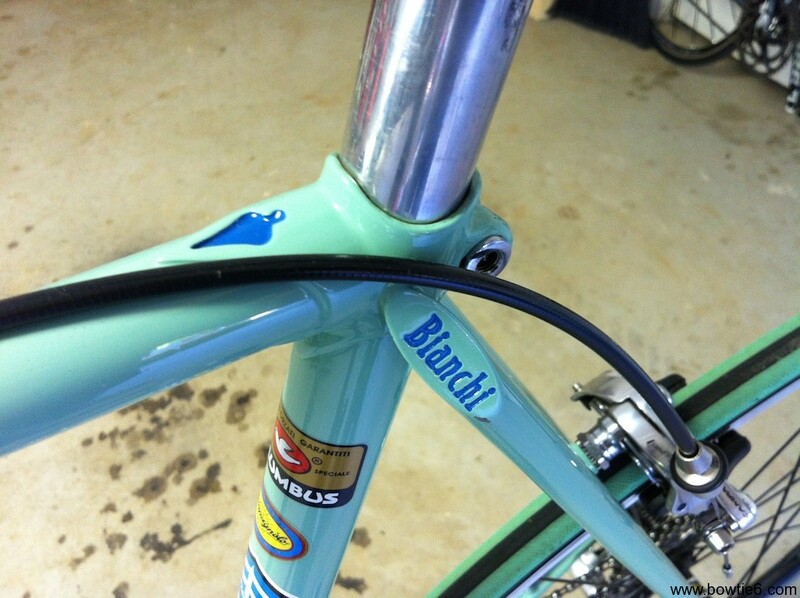 These were carefully filled with blue paint to accentuate the “Bianchi” and “B” engravings on the lugs. Finally, the seatpost has three flutes which I filled with green, white and red – the colors of the Italian flag. I know, this is overkill but then again I really wanted to make the old bike look the part. Decals were all sourced from a fellow in Australia. They were not cheap, but they are period correct and add pop to the frame. How does it ride? It is not super lightweight but it has a fantastic feel. After all it is a vintage steel bike. However, this was “the real deal” back in the 80’s and is all I ever wanted in a vintage Italian Bianchi. All the work, effort and time sure made for a nice looking bike. Update: I have written a new article with more details about the build – CLICK HERE to jump to that article. This entry was posted in 6. 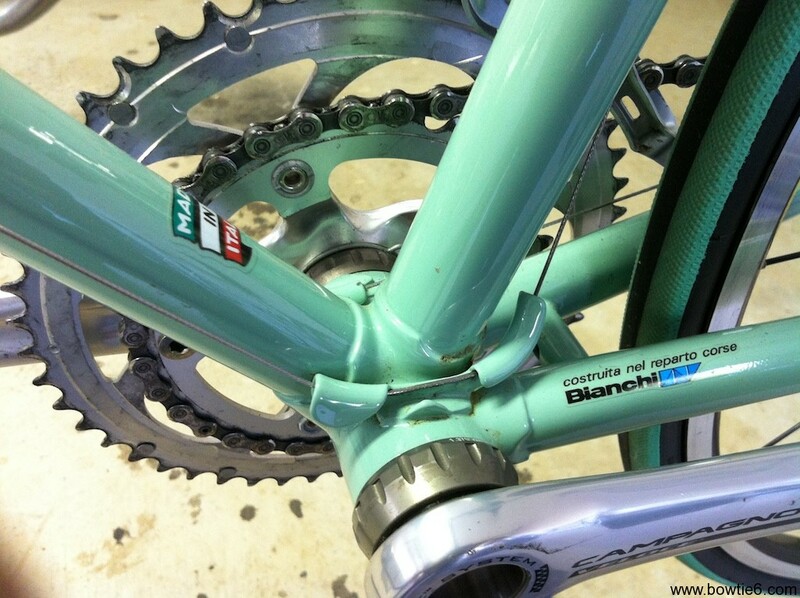 Cycling, Bianchi and tagged Campagnolo, celeste, vintage road bike on 23 Jul, 2013 @ 00:28 by bowtie6.